When analysing the gold market in the Philippines, two concerns come to mind – are the country and its investors well protected against financial crisis? Do we believe that the government could take specific steps to modernise the gold market in order to better protect the market and individual investors? Is the Philippines prepared for the next financial crisis? This is a question all Filipinos should be asking themselves as economic crises have spread through many Emerging Market countries. Argentina was recently forced to seek a $50bn emergency bail out from the IMF to shore up its currency when it fell almost 50% during this year. Pakistan is the latest country to ask for a bail out from the IMF. In Turkey, the government has also resorted to extreme measures to shore up its financial system and currency, which also fell around 50%. However, Turkey’s substantial foreign reserves of $89bn, including $18bn of gold, has helped ensure resilience and independence. So far, this new wave of EM panic has not reached the Philippines, as the Peso has only fallen modestly from around 50 to the US dollar at the start of the year to around 54 today. However, the Philippines has needed to sell foreign reserves, which have fallen $6 billion this year to a ten-year low of $78bn. So, complacency is not a good strategy, and the Philippines should proactively make adjustments in order to prepare for the next crisis. The first thing the Philippines should do is to change its policy regarding gold. The current law requires that gold and silver produced in the country must be sold to the Bangko Sentral. The problem is that the 7% tax (excise and withholding) encourages small-scale producers to sell in the grey market, or to smuggle it out of the country, rather than selling the mined gold to the Central Bank. This means that the gold mined in the Philippines is not being used to shore up the nation’s finances. A better approach would be to eliminate the tax and keep the gold in the country. The second thing is to try to encourage greater production. The Philippines is reportedly among Asia’s wealthiest countries in terms of mineral resources, with reserves of gold, silver, copper, nickel, and other metals of estimated to reach $1 trillion. However, the legal framework, including land use rights, environmental and labour regulations are not sufficiently appealing to attract major foreign direct investment in greenfield mining projects. The government should modernise rules and regulations to create a more investor-friendly environment for foreign capital. Lastly, the Philippines should encourage citizens to buy and own gold for their own savings. 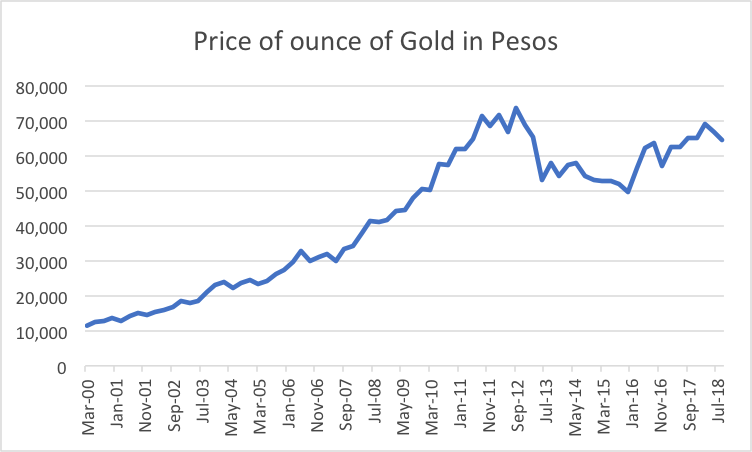 Time has shown that gold has maintained its value versus the Peso. In the chart above, you can see that an ounce of gold has risen over five times from around 10,000 Pesos in 2000. One idea is to encourage citizens to set up retirement accounts, including gold that will reduce the need for government welfare in the future. Moreover, gold has the advantage of being globally recognised and not subject to the same restrictions on transfer as dollars which need to flow through the regulated banking system.